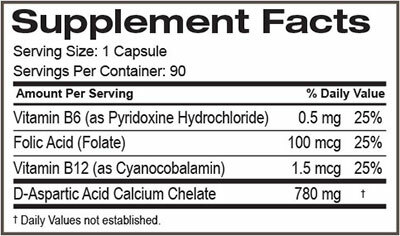 SD Pharmaceuticals’ D-ASPARTIC ACID DAA™ delivers 780 mg of D-Aspartic Acid Calcium Chelate and a synergistic B-vitamin complex in every capsule! 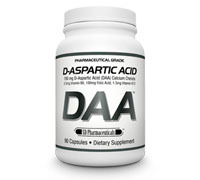 WHAT IS D-ASPARTIC ACID (DAA)? 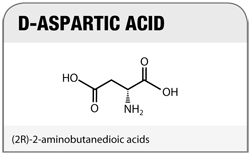 There are two forms of aspartic acid, (1) L-aspartic acid, and (2) D-aspartic acid (DAA). The L-isomer of aspartate (L-aspartic acid) is one of the 20 proteinogenic amino acids, whereas the D-isomer form (DAA) is best known for its testosterone-boosting properties! HOW DOES D-ASPARTIC ACID WORK? 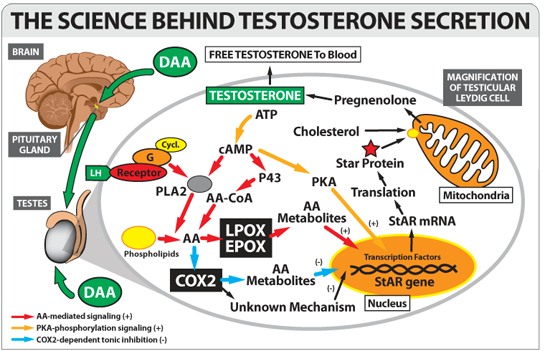 Research shows that D-aspartic acid (DAA) can accumulate in the testes and may activate the Leydig cells to secrete more natural testosterone. DAA may also have actions in the central brain region and activate the pituitary gland to initiate more natural hormone production. In a very well-known study that was conducted in Italy, subjects supplementing with 3,120 mg of d-aspartic acid + vitamins B6, B12 and folic acid experienced an increase in testosterone over the course of just 12 days! (Adults, Male): Take 2 capsules, twice daily.